The Maughan Library is the main research library of King's College London, forming part of the Strand Campus. A 19th-century neo-Gothic building located on Chancery Lane in the City of London, it was formerly the home to the headquarters of the Public Record Office, known as the "strong-box of the Empire", and was acquired by the university in 2001. Following a £35m renovation the Maughan is the largest new university library in the United Kingdom since World War II. Designed by Sir James Pennethorne and constructed in 1851, with further extensions made between 1868 and 1900, it is a Grade II* listed building. Inside the library is a dodecagonal Reading room, inspired by that of The British Museum, and a former medieval chapel, now an exhibition space showcasing the special collections of the library. The library was named in honour of Sir Deryck Maughan, an alumnus of the university. 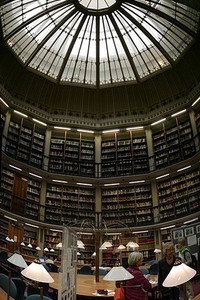 Here's the our members favorite photos of "Libraries near City of London". 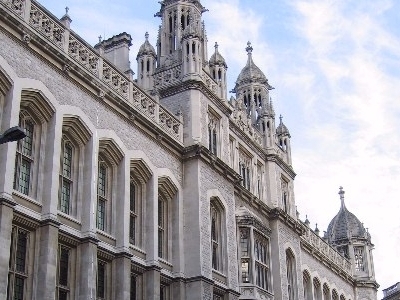 Upload your photo of The Maughan Library!